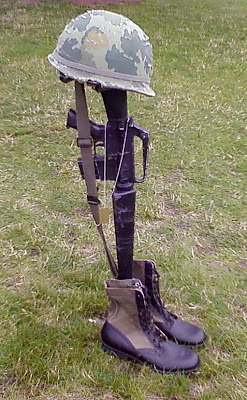 I've never heard of the Traveling Vietnam War Memorial - it's a wonderful tribute to those whose names it bears. 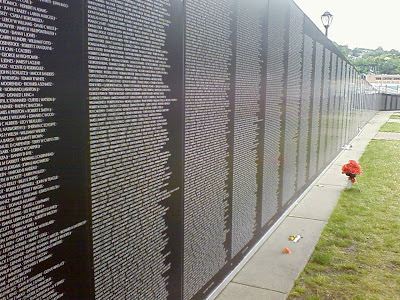 It seems that the wall makes you look hard to find names - with the enormous list of victims, the sheer looking has to make one ponder...Ponder the lives lost and families broken. We tried to maintain a free South. 'Uncle Ho' was truly a SOB, most of those in the South that didn't want to live under the North. We tried to keep a free country, and the shame is the number of South Vietnamese who died in those infamous 'Reeducation Camps', or risking a treacherous sea crossing to get away. Proud to have had the honor of doing the EMS stand-by on Friday night for that event. The Wall is still very touching - even in 3/5 scale. The messages (yes, there is definately more than one way to "view" this monument) are timeless, and so very important to remember. Good job w/the pics, Linda...but Amy's made me cry! What a great post about your city's big celebration and especially for posting that video to such appropriate song. Our little village here lost one of its "sons" in Vietnam -a young man about 4 years younger than me, serving as a medic, who gave his life there. He was the oldest of ten children and he and everyone one of his siblings was, at one time or another, our paperboy. A darned good kid he was -just as nice as the day is long. Thanks for a reminder that we should never forget those who sacrificed so much for all of us. My uncle came back safe and whole, and I'm thankful for that every day. Many years ago when I was living in Tennessee the wall came there. I was very moved at the time. I hvae been wanting to go to DC for awhile to see the real one, but just hate the thought of facing all the traffic headaches involved in going to DC. It is bad enough to take the bi-pass around when we travel from our area to Gettysburg. What an awesome sight to see. Thanks for sharing the photos and the story. Great post, Linda. 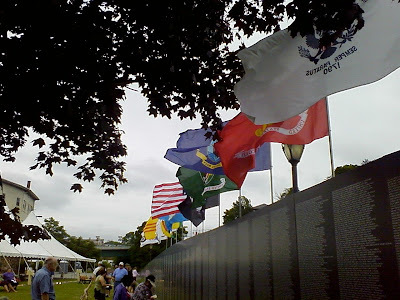 I've seen the traveling wall, but have yet to go to see the real one in D.C.
No one spoke above a whisper at the traveling wall, I imagine it was the same in Norwich. I'd also love to see the WWII Memorial in Washington. Some day.. I saw this wall in West Palm Beach many years ago, that is when I knew I had to go to DC and visit my friends. 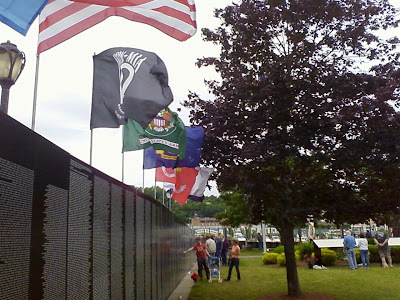 The traveling wall gives so many people the opportunity to visit that could not make the trip to WDC. Each of the war memorials were very moving to see in person. We were at the Vietnam Memorial at dusk...and the lit candles added to the impact. I was especially moved by the Korean Memorial too. I'm glad you took the time...and took the girls to see the exhibit. 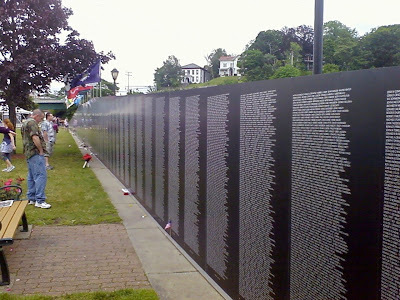 The wall came to Coventry a few years back and was extremely emotional for me and I don't personally know anyone so I can't imagine how it is for family and friends of those that have fallen in the defense of our country. Very nice. We saw the memorial in Sandusky Ohio last year.